Bagel Boss tries to fill the hole left by Tavares. Now that John Tavares has left the Islanders, you may be wondering what to do with your No. 91 Islanders jersey. Bagel Boss in Hicksville has an idea. 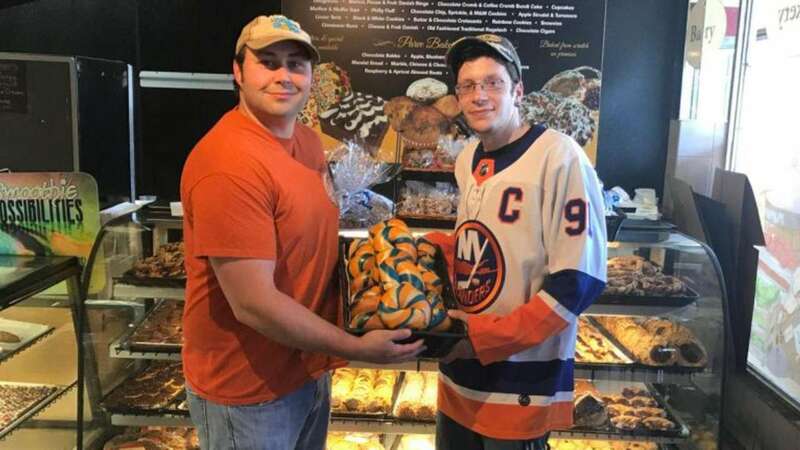 The store tweeted an offer Monday morning encouraging fans to bring in their Tavares jerseys in exchange for a dozen bagels. David Rosner, co-owner of the Bagel Boss in Hicksville, and Donald Rosner, owner of the Bagel Boss in Murray Hill in Manhattan, hope to see some good come of the star’s decision to leave their favorite team. Any Tavares item turned in to the Bagel Boss Hicksville location will be donated to charity, but David and Donald haven’t decided the specific charity yet. The cousins started the #BagelsFor91 Twitter campaign last week, offering Tavares a lifetime supply of bagels if he re-signed with the Islanders. The shop made up special blue, white and orange bagels for the occasion. But the No. 1 selection in the 2009 NHL Draft signed a seven-year, $77-million contract with his hometown Toronto Maple Leafs on Sunday. “We’re calling them Islanders bagels now,” Donald Rosner said. Donald and David are big Islanders fans and said they wanted Tavares to stay on Long Island. Ultimately, they understood his decision. The cousins don’t want to see a scene similar to when LeBron James left Cleveland to sign with the Heat in July 2010. Feeling angry and betrayed, fans responded by burning James’ jersey. John Tavares leaves Islanders for Maple LeafsThe Islanders' worst fear has been realized. John Tavares, the face of the Islanders franchise from the day he was selected first overall in 2009, will no longer be their player. Tavares agreed to a seven-year deal with his hometown Toronto Maple Leafs. Herrmann: Can you blame Tavares for leaving?Just as Tavares had the right to test the waters and make the plunge, fans have every right to boo and blame him. Just don't forget there is plenty of blame to go around. Isles fans most upset at the way Tavares left"I was hoping he would want to stay and be the franchise player that would get them to that next level, especially with the new management and new coach," James Pollin of Lynbrook said. John Tavares’ timeline with IslesA look at John Tavares' career with the Islanders -- and how he wound up with the Maple Leafs.